Tonight was the official launch of Tesla’s new electric semi. At the event, Tesla CEO Elon Musk announced the key features of the new haulers, such as their 250-mile range and upgraded seating structure. He also unveiled something entirely unexpected. 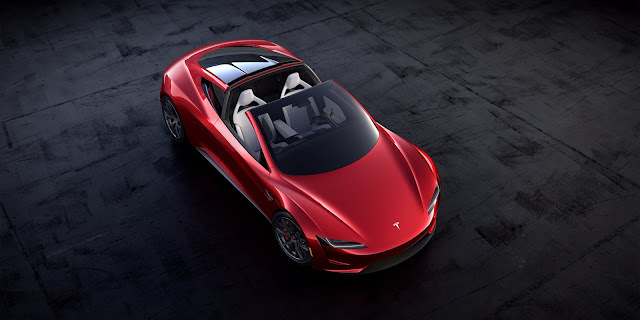 The new roadster. You read that right. In typical Elon Musk fashion, at tonight’s launch event for the Tesla semi, Musk officially unveiled the new roadster. No warning. No big pre-launch lead-up. Just a car driving out onto a stage. And this car comes with some pretty remarkable numbers. For starters, it can go from 0 to 60 in just 1.9 seconds. This would make it the first production vehicle to break past the 2-second mark. If that’s not impressive enough, it can go from 0-100 in a staggering 4.2 seconds. At the time of the unveiling, Musk asserted that it is the fastest production car ever made. He went on to add that it has a top speed of 250 mph and that the car will be able to travel around a quarter mile drag strip in just under nine seconds. It will lay the “smackdown” to the fossil fuel obsessed auto-industry. But perhaps the most notable thing revealed is that it has a range of over 600 miles. At the event, Musk clarified that this comes thanks to the vehicle’s 200 kWh battery pack…and that it is this pack that will, to quote Musk, lay the “smackdown” to the fossil fuel obsessed auto-industry. If the numbers hold true, it will be hard to argue against Musk. Picture driving from San Francisco to LA and back without stopping for a charge (or for gas). The somewhat less impressive — but nonetheless important — facts are that the car is a 2 by 2 four-seater, and it is currently slated to be available in 2020. However, if the model 3 production serves as an accurate baseline, it is fairly reasonable to assume that production will hit snags and the release date will be extended for some time. The price was, unfortunately, not released. Stay tuned for more updates as they come in or watch the event below.